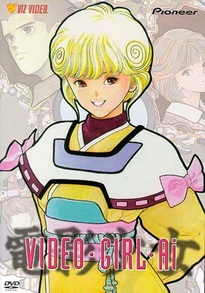 Finally the animated series of Masakazu Katsura's hit teenage romance manga, Video Girl Ai! Yota Moteuchi has a nickname among his high school peers - "dateless." Shy and lonely, Yota can't seem to face the love of his life, Moemi, to tell her his true feelings. Then, while walking the streets in a state of depression, Yota comes across a mysterious video store, Gokuraku, and rents a video starring cute young idol Ai Amano. But when he puts the tape into the deck and hits play, this video girl comes to life and jumps out of the television straight into his arms! Now, this real-life video girl has decided to help Yota improve his love life whether he likes it or not!